At the beginning of the twentieth century Sam de Wolff developped his own version of the labour theory of value (LTV), which may be called interesting and original1. However, De Wolff has not found the time, at least in his main work Het Economisch Getij, to elaborate on the consequences of his model. The present column has the aim to make a first start. The starting-point is the model, that has been formulated in two preceding columns. In the first column an economy of demand and supply is modelled in its simplest form. The second column extends this model to an economy with a variety of products. This is commented in the present column. It will be supplemented with a description of the opinion, that De Wolff gives on the various types of labour. De Wolff gives only a summary explanation of his opinion on these types of labour, so that it makes sense to annotate them in the present column. Therefore the column is less a description of the findings of de Wolff than an argument about the model of De Wolff. In the model of de Wolff the labour time t has several functions. Firstly, she determines the desire of the consumer for a certain product. The pleasure L of the consumer increases according as he obtains a larger quantity X of that product. The labour productivity ap relates the quantity X in a natural manner to the amount of labour time tX, which is spent for its production2. As a consequence the pleasure L for that product is a function of the labour time: L = L(tX). Here the functional relation is not dynamic, but just a statement beforehand (ex ante): the consumer knows the pleasure L, which he experiences thanks to the quantity X, going with the time tX. For the consumer the pleasure L and the related t are in the first instance static. This can be seen clearly from the fact, that the pleasure of the consumer is not affected by the time of acquisition of the products. Usually he will be contented, when he acquires his wage goods all at once at the end of his working day. In general his pleasure will not increase, when he for instance receives the fish before the corn. If these two products are offered on the market, then fixed iso-pleasure curves can be drawn in the (tg, tv) plane. The curves express a potential pleasure, which can be satisfied only by (the income of) performed labour. Secondly, the labour time t determines the effort of labour, that the producer is willing to supply. The accomplishment of labour leads to a certain disutility, a displeasure O(t), which increases with the duration of the work. In case that the producer, also worker, disposes of self-knowledge, he will of course foresee his displeasure. But yet the labour time t confronts the producer with more dynamics than the consumer. In the production the labour time seems to advance, and so she is not static. In the eyes of the worker the last hour of labour is not equal to the first hour, for during the day the labour will become a heavier burden. The continuation of this column will show, that the succession of hours is especially relevant in situations with different types of labour. Moreover the labour is a succession of decisions: the worker must always decide, whether he wants to enlarge his purchasing power by working longer. A higher income promises a larger pleasure for the worker, in his role as consumer, but to him this increase seems to be realized by his labour. For during the labour the income is earned, or at least a claim on material goods. Certainly an ideologist like Sam de Wolff must have developped his theory of labour value for a political purpose. He does not engage in this analysis out of purely scientific curiosity. It is obvious that he wants to use the displeasure of labour as an argument for the reduction of labour time, an for fair breaks, more holidays, and an early retirement3. The formula 2 shows that in general the displeasure due to the last produced unit of the good is larger than for its predecessor. It is obvious that the worker wants a larger hourly wage in compensation for his larger displeasure. Even if the hourly wage is averaged over the duration of the entire working day (8 hours), then it may still be expected that overtime will demand a higher reward. 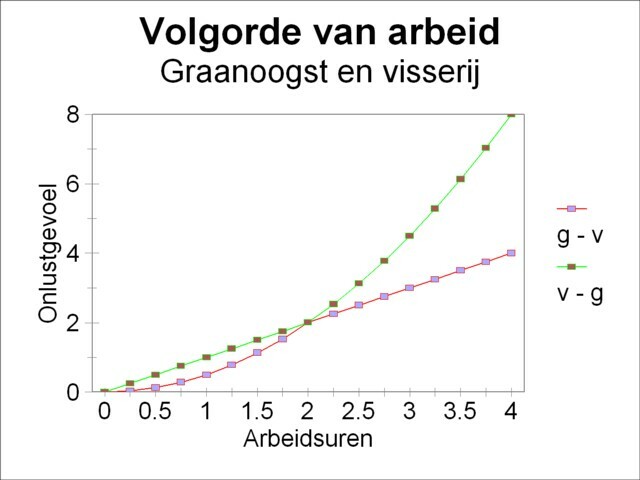 This suggests that overtime could push up the piece-wage of the good, and thus its price or value. In any case it is a fact, that in the subjective experience of the worker the later produced units have a higher price. 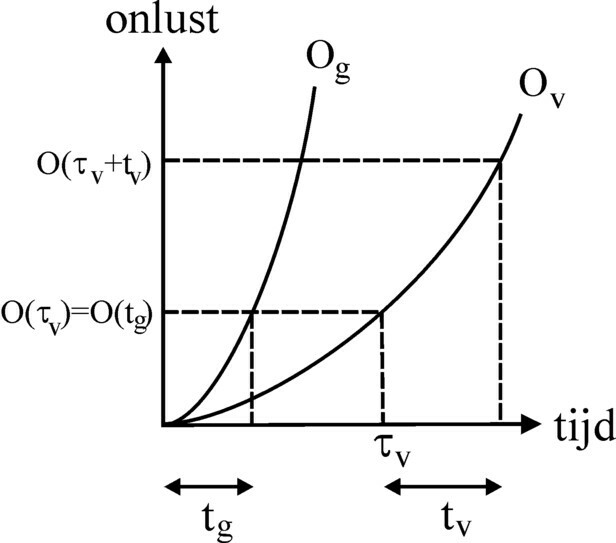 Then the intensity of displeasure is given by OI(t) = t. The most economic (optimal) production is found by determining the intersection of the combined pleasure intensity LI(t) and the displeasure intensity OI(t) of formula 3. Following De Wolff one finds with these formulas, or from the figure, that the intersection occurs at t=93/5 working hours. This is the time, that the person is willing to work. A part of 42/5 hours is spent on the harvest of corn, and 51/5 on fishing. The figure 1 is a graphical display of the formula 4 in the (tg, tv) plane. The curves are so-called iso-pleasure curves, where the pleasure is equal, or to put it differently, the pleasure is constant. In the theory of marginal utility a similar figure is used for the determination of the optimal consumption with a given budget. Then the figure displays the so-called iso-utility curves (curves where the utility is constant), together with the budget line (the possible combinations of products, that can be bought with the given budget)7. In the model of De Wolff the analogy is the displeasure line. In this case the displeasure line represents the constant displeasure O(t)=c. Because of the formula 3 one finds ½×t2 = c, and thus t=c' (with c' = √(2×c)). Note that a part tg of the working time t is spent on the harvest of corn, and the other part tv on fishery. It follows that tg+tv = c' must be true, or tv = c' − tg. This is a straight line in the (tg, tv) plane. If desired c or c' can be interpreted as the budget of displeasure, that is owned by the person. The method, which is used in the theory of marginal utility for the calculations of the optimal consumption at a given budget, is adapted in the model of De Wolff in the following way. First the slope of the displeasure line is determined, so (dtv/dtg)O. Here dt is an infinitisimal time step. Then the iso-pleasure curve is identified, which just touches the displeasure line. So there the slope (dtv/dtg)I of the iso-pleasure curve is equal to the slope of the displeasure line. Only one such iso-pleasure curve exists, because iso-pleasure curves can not intersect each other. Then the point of tangency (tg, tv)r is the desired optimal solution. The consequences of this method can readily be identified. Just now it has been shown, that the slope of the displeasure line equals -1. On an iso-pleasure curve one has dL(tg, tv) = 0. In other words, L does not change along the curve. Substitution of the formula 4 in dL=0 yields the expression (∂Lg/∂tg) × dtg + (∂Lv/∂tv) × dtv = 0. So LIg × dtg + LIv × dtv = 0. It follows from this, that the slope of the iso-pleasure curve (dtv/dtg)I is equal to -LIg/LIv. In the point of tangency, that (as said) represents the optimal combination of products, this slope is equal to the slope of the displeasure line. 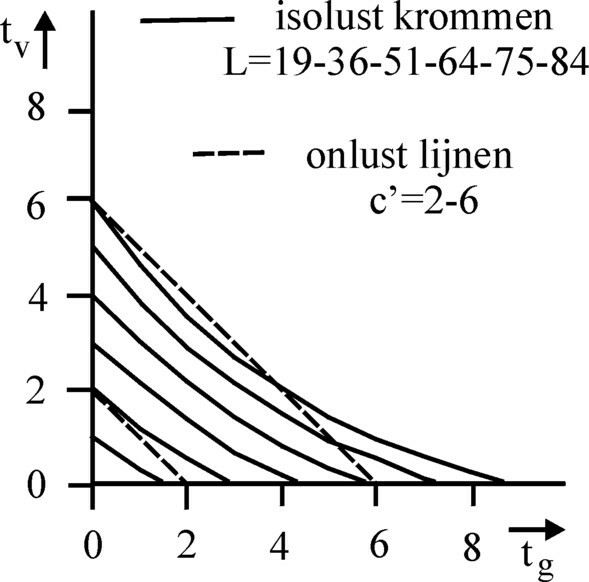 So -LIg/LIv = -1, so that LIg = LIv. This is just the condition, that is used by De Wolff for the construction of his combined pleasure intensity. Thus it is proven, that indeed the method of De Wolff and the method of the theory of marginal utility yield the same allocation of the available labour over the two product branches. As said, the amount of labour, which the Robinson person makes available in total, depends also on his intensity of displeasure OI. De Wolff is seduced by his ambition to consider also the case, where each type of labour carries its own displeasure. Then the harvest of corn and the fishery each have their own function of displeasure, still in the form of the formula 1, but with different coefficients p1, p2, ... . Indeed the traditional labour theory of value acknowledges, that each type of labour requires its own particular effort, because it needs a specific knowledge and skill. Nevertheless it is commonly assumed, that the effect of the differences in labour are of minor importance. Therefore De Wolff could with a clear conscience have ended his model here. This new refinement confronts him with the question how the various displeasures O(t) should be added. In the formula 4 a cardinal addition is performed, because it is irrelevant for the pleasure of the Robinson person whether the corn is obtained first, or the fish. Unfortunately the cardinal addition does not hold for the displeasure. For when someone has fished for a number of hours, he will keep his fatigue during the succeeding harvest of corn. In his subjective perspective the harvest does not start at tg=0, for he has a past of work, and thus there is a sequence. Therefore a complicated question arises: suppose the Robinson person wants to reach with his labour a certain point in the (tg, tv) plane, because he strives for the corresponding pleasure (see the figure 1). Then how should he divide his working day in order to experience a minimal displeasure? Which trajectory should he pass through in the (tg, tv) plane? Should he harvest first, or should he start with fishing? This is by no means a trivial question8. De Wolff does not really dwell on these dilemmas. He simply assumes ("It is plausible") that the total displeasure is independent on the sequence, in which the production is carried out9. His method is as follows: suppose first there is a harvest of corn during a time tg. The corresponding displeasure is Og(tg). Then the same person continues with fishing during a time tv. His displeasure at the beginning of the fishing can be interpreted as a displeasure Ov(τv), where it seems as if he has already fished during a time τv. The time τv can be calculated from the equation Og(tg) = Ov(τv). At the end of his working day the displeasure of the person is equal to Ov(τv + tv). The figure 2 shows graphically how the method of De Wolff works. The formula 6 defines when the sequence for the performance of two types of labour can be exchanged without consequences. An example may clarify this. Suppose one has Og(tg) = ½×tg2 en Ov(tv) = tv. Here (p2)g=½ and all other (pn)g are equal to zero, (p1)v=1, and all other (pn)v are equal to zero. Evidently the coefficients in this example differ from the formula 6, so that in this situation the types of labour should not be interchangeable. In fact the formulas 5a-b show that τv = ½×tg2 and τg = √(2×tv). Substitution in the left hand side of the formula 5c yields Ov(τv + tv) = τv + tv. However, substitution in the right hand side yields Og(τg + tg) = τv + tv + 2×√(τv × tv). Then the left and right hand side of the formula 5c are unequal. The figure 3 shows this also in a graphical way (with tg = tv = 2 working hours). Dependent on the sequence of labour the displeasure in this figure is equal to 4 or 8. Indeed the system of displeasure Og(tg) = ½×tg2 and Ov(tv) = tv does not permit an exchange. So according to De Wolff such systems of displeasure are not plausible. De Wolff words it like this: "Here the rule holds, that the intensity balances (columnist: those are (LI − OI)g and (LI − OI)v) are zero for each good, or the ratios of intensities (columnist: those are (LI / OI)g en (LI / OI)v) are equal to 1"11. This marks the most economic production. So although the ratios of intensities are all identical, and due to the formula 5c also the displeasures, this does not hold for the pleasure intensities. In general LIg(tg) will differ from LIv(tv). De Wolff illustrates his method with an example. He puts Og(tg) = ½×tg2 and Ov(tv) = 2×tv2. It can simply be seen, that these displeasures obey the formulas 5a-b-c. It follows that τg = 2×tv and τv = ½×tg. De Wolff uses for the pleasure again the formula 4. Using the formulas 7a-b one finds after some simple calculations, that the economic production must obey tg = 5½ working hours and tv = 1½ working hours. Apparently in this situation the Robinson person chooses a total working day with a duration of 7 working hours. Previous columns on this portal have shown, that De Wolff is not afraid to present bold assumptions as a truism, and to defend them spiritedly. Nevertheless your columnist is by no means convinced that the assumptions 5a-b-c and 7a-b of De Wolff are really plausible. But if they are accepted, then they provide for a complete LTV model for the calculation of the optimal production in an economic system with two branches. Your columnist would certainly for the previous text welcome suggestions for improvements, additions and other remarks.